It is a common misconception that the State will look after us from cradle to grave. The truth is, if you or your loved ones become reliant on state benefits, your standard of living and lifestyle will suffer, and you could end up living in poverty. It is sensible to put in place solutions which mean you are in control of your own finances and your own future, so you are not reliant on benefits should something go wrong. 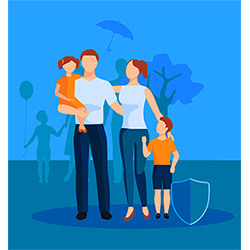 We recommend that our clients seriously think about committing a small amount of their income to protection policies such as life assurance, critical illness cover, and income protection cover. Protecting your loved ones and your income is just as important as investing money for the future. By putting that protection in place, you're ensuring the future lifestyle you want. We can help you protect yourself against life changing situations by using family and income protection. There are lots of options available including Life Assurance and Critical Illness Cover. Taking steps like this will make sure that your loved ones are protected as well as yourself. There is a bewildering amount of different financial protection policies with different options available on the market in the UK. Expert advice is invaluable in helping to design a protection solution that meets your individual needs as well as your budget. Life Insurance is a simple contract that provides either a lump sum or a regular income over a specific term. The contract can be written on either a joint or single life basis. This type of cover is usually used in the event of the death of a breadwinner, and will cover debts, or provide dependants with a lump-sum to invest or regular income. Income Protection provides a replacement income should you be unable to work due to sickness or an accident. Typically, policies will cover up to 75% of your income after a specific period of not being able to work, i.e. deferred period of one month, three months or six months. These policies will normally continuing paying out until you return back to work or retire. These are just an indication of the types of cover that can be taken out, it is not an exhaustive list. Your adviser will be able to recommend a solution that meets your individual needs and your budget, as well as answering any questions you may have. All employees of a company are important, but the death or serious incapacity of a director or key member of staff can have a devastating effect on a smaller business which might rely on that key individual to keep it running. There are several different types of policy, with an array of options to cover various circumstances, but a Keyman policy for example, can provide a cash injection to a business in the event of the 'loss' of a key person. This money can then be used to hire a temporary replacement or to help cover a loss of profits until a new person is in place. Expert advice is important to ensure the right type of cover is in place to protect your business against the unexpected. Please Note: Life Cover (non-investment) and income protection cover - the plan will have no cash value at any time, and will cease at the end of the term. If premiums are not maintained, then cover will lapse. Critical illness cover - the policy may not cover all definitions of a critical illness. For definitions of illnesses covered please refer to the Key Features and Policy documents. Very informative and helpful... and would happily recommend them.